Richmond City Hall is located at 450 Civic Center Plaza, Richmond, CA 94804; phone: 510-620-6509. Photo: Point Richmond seen from nearby Nicholl Knob, Richmond, CA. Photographed by User:ILike2BeAnonymous (own work), 2007, [cc-by-3.0 (creativecommons.org/licenses/by/3.0)], via Wikimedia Commons, accessed August, 2015. After Mexico won independence from Spain in 1821, large tracts of land in California were granted to military heroes and loyalists. In 1823, Don Francisco Castro was given 17,000 acres of land in Contra Costa, which became known as Rancho San Pablo. The Castro family retained large numbers of Native Americans to work their rancho. The Castros also operated a ferry-shuttle freight service from Point Isabel to Yerba Buena Village (San Francisco). With the expansion of the cattle trade to the international market, especially the eastern United States, Castro and other landowners became barons of a major industry that flourished throughout the 19th century. The City of Richmond was established on a portion of Castro's land grant about 70 years after his death. After the Mexican-American War, Mexico ceded California to the United States. Many squatters settled on the huge Castro landholding, sparking court proceedings that lasted nearly 50 years, deterring developers from the region due to uncertainty over land ownership. The Castro's ferry-shuttle at Point Isabel provided a service for gold miners in 1849. By 1859, the San Francisco market was made readily accessible to West Contra Costa ranchers by cargo shuttle-ferry service at Ellis Landing, where Captain George Ellis ferried freight aboard his two sailing vessels, the Sierra and the Mystery. More people started to settle on the lands surrounding the bay, contributing to the rich multi-cultural identity that still characterizes Richmond today. Farming expanded from family gardens to commercial market gardens grown by Portuguese, Italian and Irish immigrants. Fruits, vegetables, hay and grain were raised while intensive stock and dairy ranching dominated the Potrero and Wildcat canyons. Around 1870, a shrimp village was established by Chinese fishermen at what is now Point Molate. For nearly half a century, fishermen lived and worked at Point Molate, capturing bay shrimp for local markets and international export. Many Chinese also later worked for California Cap Works and the Metropolitan Match Company. With the dispute over the Castro family's Rancho San Pablo finally resolved in 1894, real estate development began and Richmond changed forever when the transcontinental Santa Fe Railroad arrived at Point Richmond in 1900. Passenger rail service between Chicago and Point Richmond prompted the location of Santa Fe's shops in Point Richmond, as well as the construction of the Standard Oil Company Refinery (known then as Pacific Coast Oil). Standard Oil quickly expanded to cover 1,800 acres and became the City's largest employer. The first hotel, fire station and city hall were located in Point Richmond, which was firmly established by the year 1900 with some 2,000 residents. 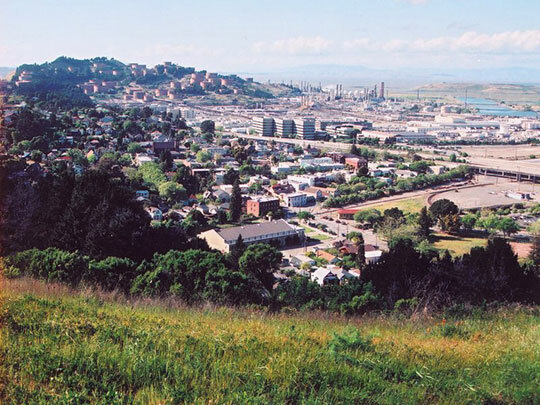 City of Richmond California, General Plan 2030: Historic Resources, 2013, www.ci.richmond.ca.us, accessed August, 2015.